Nylon double towel hook, 15 colors available. With 15 colors to choose from, our Nylon Accessories coordinate with our wide selection of grab bars and will create a less institutional look in the bathroom. 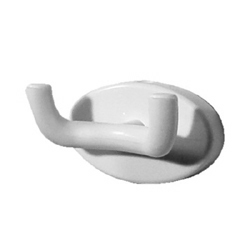 Our Nylon Double Towel Hook measures: 2-11/16”W x 1-11/16”D. Please allow 2 day lead time for White (W1), Biscuit (I2), and Ivory (I1). Please allow 4 to 6 week lead time for all other colors. The Adaptive Living Store can not cancel, return or refund custom order items.